We are the editors of Ink Smith and Native Ink. We, like everyone else, are human. I think many times we forget that publishers are people too. We want to one day take on the big publishers, but we want to be unique in our own way. Ink Smith isn’t a factory of authors but rather a family of authors. We take pride in the books we select for publishing, as the rates for receiving a contract is about 4-5%. We communicate through different means which includes email and our Ink Smith/Native Ink Facebook group. Why Facebook? This gives our authors a more personal platform which creates a unique bond between each other. This is the “family” aspect. They work together, encourage each other, and in a way become friends. It’s like co-workers in an office. Instead of just having their books on a page together, they work together, sharing different ideas, talking about different writing topics and help promote each other. With that being said, we will make spelling errors, use shorthand grammar and put in a LOL every so often. Here at the Inkwell and Quill, we want to promote our authors, their work, talk about writing and the publishing industry. Sometimes we talk about things that authors do during the submission process that will get them the fast track to a rejection and other times we see things that authors do that we feel others should know about. Of course most important, you must keep in mind that every publisher is different and doing research on each publisher can result in less rejection. We are trying to help the best we can, even if your book doesn’t find a home at Ink Smith Publishing or Native Ink Press. Ashley has a B.A. in Business Management and an author of several books and publications. She has been writing for over a decade. She brings to the company the light-hearted fun spirit Ink Smith embodies. You won’t find bland responses, or short one word answers from her. She has a passion for writing and a love for the arts. Don’t be fooled by her exclamation points at the end of her sentences, Ashley is strict on her idea of well-written imagery and bringing the characters to life. It’s not just about the words on the page. The story should transport the reader off into distant lands and fall in love with characters. Submissions should be addressed to Ashley. Corinne graduated with her MFA in Writing from Lindenwood University after completing her B.A. in Journalism, and recently completed her MPS in Publishing at George Washington University. When she isn’t buried in books she’s devouring them, editing them, or making up her own. Corinne has been a copy-editor, headline writer, Editor-in-Chief and when needed, a book designer. Since her first trip to the library when she was a toddler, Corinne has been collecting books, recommending her favorites, and providing commentary on the less-than-stellar. Corinne’s belief is that if you have a problem, it’s nothing that a good book can’t solve. Valerie is an award winning author of several books including Dracona’s Rebirth published by Ink Smith. In college, she studied writing and fantasy lit before graduating with an Associates degree in Communication. She has done editing, formatting and been a writing coach. Valerie has been an invited speaker at events like Comic Con, FanX and writer’s conferences as an expert in world building. She is currently working on a new series with help and hindrance from her cats. Although she writes young adult books they are loved by those who are young at heart. Kayla Darling graduated from Lycoming College with a bachelor’s degree in Creative Writing. An avid reader and writer, she can usually be found with her nose in a book or squinting at a computer screen, and hasn’t been without a personal writing project since elementary school. She currently works as a content writer. Rachel recently graduated with her B.A. in the Arts, majoring in English with Creative Writing Emphasis and a minor in History. She grew up around literature ever since entering the hallowed halls of the library and bookstores. She has been interested in book publishing ever since her Third-grade trip to a bookbinding facility. Her love for words influenced her overactive imagination to someday bring her own characters and stories to life, with hopes to be published. Reading and writing give Rachel a passionate and compassionate purpose in life. Rachel believes books provide life lessons and assistance when one suffers from harsh world realities. Kelsey has had an unwavering love of reading and writing ever since she was very young. She dreams of one day becoming a published author and has tackled a number of literary projects in order to improve her writing. Kelsey graduated from the University of California, Santa Barbara with a B.A. in English and a minor in Professional Writing. This minor allowed her to focus on Multimedia Communications which emphasized coding and digital writing methods. While attending this beautiful college, she also wrote for the campus newspaper and contributed regular columns to the food section. Outside of school, she worked as an editor for a number of different publications including The Fox Magazine and Vocalady Magazine. 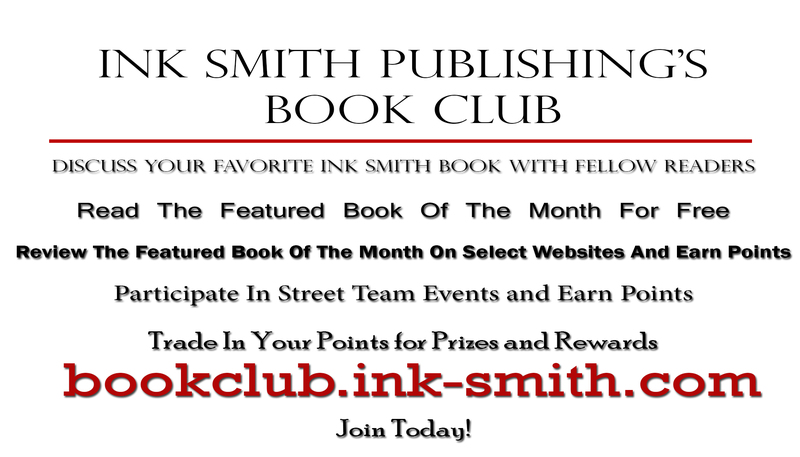 Ink Smith Publishing is a small independent publishing house with big dreams. Our authors and editors work closely together to develop their books, marketing plans, and sales. We tiptoed through our first year, 2012, with only two books published. However, we have focused on preparing and publishing more books each year as we get a little older. Our books have sold internationally, including Canada and the UK. We work openly with our authors and connect on all social mediums including email, Facebook, and texts. It may not be the traditional form of communication that other publishers use, but it allows our authors to get those eager questions answered as soon as possible. Further providing the dedication to our authors that we try our hardest to bring. We are a paying publisher offering a starting rate of 13% royalties for print books and 18% for e-books. Originally, we wanted to focus our efforts specifically on three genres. However, as we grew we realized we wanted to publish interesting stories readers would enjoy. Scream If You Wanna Go Faster was the second book we signed. We decided to publish it not because it was just well written, but because we knew people wanted to read a great story with memorable characters and an exciting journey. It’s simple, it’s not about the genre or perfect writing here at Ink Smith, but the warm feeling you get as you finish reading a great book. The first book in Native Ink Press’ catalog released in February 2014. Just like Ink Smith Publishing, Native Ink Press is dedicated to its authors and creating a close relationship with each and every one. Together we can build a great foundation for selling books to eager readers. For submission requirements, please visit our website: www.nativeinkpress.com/submissions-2/.